1987 Simon Super Snorkel SS600 Hydraulic Platform. 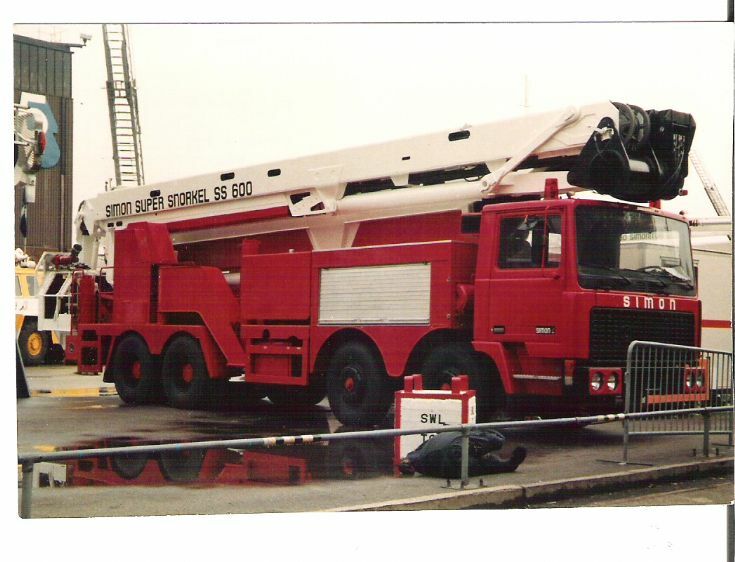 Photographed at the Fire Expo in Bristol in 1987,this photograph shows the Simon Super Snorkel SS600 Hydraulic Platform,the heighest working firefighting platform in the world. For the first time in 1988,the Simon Super SS600 platform,the flagship of the Simon range of Fire Fighting & Aerial Rescue and Access Equipment was demonstrated to fire chiefs from around the world,but even by 1988,the SS600 was already in use with brigades worldwide.Egypt,India Korea, Tiawan and Kuwait had them already in use. In 1986,a confirmed order for 2 Simon SS600's was placed in the order books from the USSR,then in 1987 a further order for six SS300's(30mtr)for the Moscow region were ordered.Simon manufactured the complete units including hydraulic jacking systems and mounted them onto Russian'Kamaz'lorry chassis. The Simon Super Snorkel SS600 with its unique 60mtr upreach,combined with a 22mtr outreach made it one of the most remarkable fire fighting, rescue appliances in the world.Also what was remarkable was that its foulded length was only 12metres'on the road'.....Quiet Remarkable. If not mistaken Delhi Fire Brigade in India bought this Simon Snorkel unit also. Added by Bomba Boy on 19 May 2009. Pete,are you SURE that this is Bristol? Added by Bob on 19 May 2009. Hi Pete, I cant remember what year but I seem to remember one of these at the fire exhibition at Birmingham. We went up in the thing but to its full high. Added by Paul Warnock on 19 May 2009. Bob,I'm now certain this was'nt Bristol where I took this photograph having looked through old negatives from the 1987 Bristol Fire Exbo.It was I think maybe at Birmingham at the NEC. Added by Pete Matten on 20 May 2009. Bristol,as well as th HP of course! Added by Bob on 20 May 2009. Bob and all,the above photograph was actually taken back in 1984 at the'Fire Exhibition'held that year in Birmingham,I've just found my old negatives. The Chubb Protector thats just visible in the picture that Bob mensioned is reg-A73 JKF,and this was for Liverpool Airport Fire Service.All the other above information in reference to the Simon Super Snorkel is correct. Thanks for posting this and the info. Didn't know about those Russian ones, as you said I have seen a photo of the Cairo (Egypt) and Delhi ones both on the shown Terberg chassis. Delhi also had one on a Volvo FL10 chassis as did Bangkok; Thailand. And Singapore had two on a Scania chassis. If anyone knows more or have photos I love to see those. Added by Fire995 on 22 May 2009. With regards to the machine in the picture.I can confirm that this machine did not go anywhere out of this country as it was sold to a Platform Hire company,until if my memory is right, it went to Russia where it worked on the Chernobyl where it was buried with another S600. Or should have been. The Machine its self was never put into any Fire service as it was to heavy at 44tons and development bought the other SS600's to the figures quoted. Cairo (Egypt) SS 600 was mounted on a Merc And all the Brazilian ones mounted on Scania which were the best one to drive as the Terberg was an air shift eight with Hi/Lo range which could pull a house down with the power but it was just to heavy and that's why they changed to commercial Built wagons. Added by Ferryman on 12 January 2010. Added by Paul Corbin on 31 March 2011.
arent there any more spares for maintenance of the ss600 and ss300? I saw both broken down in lagos and wonder why.its really a super snorkel duper machine! Added by Uvwiama Llucky on 25 June 2011.
which had been distributed via the company Bachert? Added by Thomas Rack on 26 October 2011. At least one Simon 26 meter snorkel was mounted on a Mercedes L22 tandem axle chassis with a full crew cab, some time around 1975, but I do not believe these platforms were successful in penetrating the German market, because there was no DIN standard. The Snorkel in question may have been delivered to a factory fire brigade. Added by Rob Johnson on 26 October 2011. Thomas, I only know of the 2 Mercedes-Benz/Simon Snorkel/Wumag of Stuttgart, one for Pforzheim and the 2 Magiurs-Deutz for Frankfurt am Main, which one was a Nummela platform. But it might be an export vehicle? Added by Fire995 on 27 October 2011. In 1971 the Chemical Factory of Bayer Leverkusen got a SS85 on a MB LA 1924 chassis. 1967 Stuttgart got one, which was converted into a 3 axle later. 1972 they got another one with 3axles already. 1981 a SS263 went to chemical company Hoechst. Added by Thomas Rack on 28 October 2011.
see also picture #38232 - it was definitely taken at Birmingham NEC. Added by Peter Williams on 05 March 2015. Added by Paul Corbin on 01 June 2015. My Dad operated this machine and drove it to Russia. It was owned by PTP Ariel Platforms. Added by Alan Tonkinson on 21 June 2015. Added by Paul Corbin on 25 August 2015.
this unit never served in any fire service, when it finished its rounds of shows. It was repainted in Universal Platforms colour and worked out of Acton Dep, with a Simon Engineer travelling with it for the first yearish. it also went to live aid as a camera stand. The machine returned to the factory and had a modification to the main boom, a cat track was added. Added by K Power on 26 August 2015. That is correct, was a nightmare from the start, it broke down at the fa cup final at Wembley when the hoses came through the holes in the mast and got cut. Added by Paul Corbin on 17 September 2015. Yes I was the minder fitter at the FA, and I also had to stop some of the fans climbing up the mast, I had to stand on the top of the machine with a crow bar in hand! Then I had to fix the hoses getting soaked in oil. Oh happy days. Between us the three that minded the machine must have mended those hoses stacks of times. It came back for a cat track to be put on, which by rights it should have had one from the start, but we live and learn. Added by K Power on 19 September 2015. 202 feet!!! No thank you. Not for me, that! Added by Yelp Bullhorn on 21 September 2015. Hi Yelp! 202 feet!Brontos biggest is 367, 45 feet! Maximum vertical reach is 121, 39 feet! Added by Anders Fallström on 03 October 2015. I remember Simon Engineering buying one of these back from PTP Aerial Platforms in 1986 because the Russians needed it at Chernobyl. I heard it was buried too but I've never seen any photos of either out in Chernobyl. Added by Geoff Moseley on 06 January 2016. Added by Alan Tonkinson on 28 May 2016. We are looking for 60mtrs high firefighting Hydraulic platform.Kindly advice so that we send specification. Added by Ombok Akinyi on 22 June 2017. Hi, i'm Martyn I worked at Dudley assembling the machines, we had lots of problems with them, but they were great when the modifications were done, I have great memory's of Dudley, unfortunately these ss 600 would have deemed useful in the recent hi rise fire to evacuate. Added by Martyn Glover on 01 July 2017. Added by Fire995 on 05 July 2017. Hi frank I worked on nearly all the units, from mounting the mainframes to the chassis assembling the turntables, assembling the telescopic masts and assembling the telescopic upper-boom, to answer your question on how many were built I can give you an approximate number and the country's who orders them. Eygpt had 2 and I think they had one with a fixed upper boom. Brazil I think had 10 or 11 units.but not 100% sure. chernobyl had 1 or 2 ptp platforms had 1 China had 1 or 2 we must have produced about 16 units but it was quite a few years ago, i don't know if kel powers can think of any i've forgotten, Martyn. Added by Martyn Glover on 05 July 2017. Its been a long time but one went to India Spain had one in Madrid but I got took off them when I went outside service so I don't remember any more as you have just about got the others. Added by Kel Power on 05 July 2017. The machine in your photo was really a prototype, it was modified with pivoting screw jacks for leveling the machine, the main telescopic mast was cat tract for the hydraulics to run up the outside rather than running inside the mast which was always a problem with snagging. Just out of curiosity does anyone know of any of the machines still operating please. Added by Martyn Glover on 06 July 2017. Added by Fire995 on 07 July 2017. I went up in the universal one which ptp had to cross hire because theirs was on the way to Chernobyl. Used it to inspect Porthkerry viaduct in south Wales. Added by John Pettit on 15 July 2017.